It can be hard to wear corduroy—especially a cord jacket—without looking like a college professor or a character in a Wes Anderson film. One of the keys to pulling it off successfully? A great color. 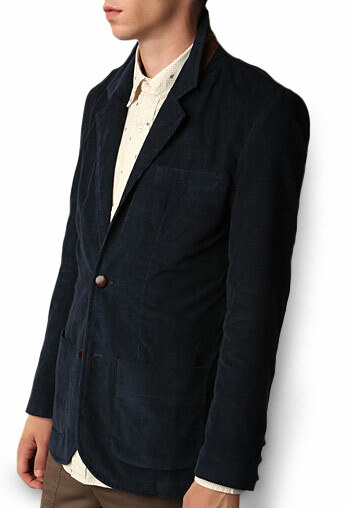 Take this navy blue blazer from Virgin Poets Society, for example. Part of Trovata's collaboration with Urban Outfitters, the partially lined jacket hits slightly higher at the waist, with slim lapels and a nice double vent. 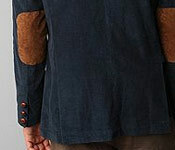 The elbow patches and a hint of contrast material under the collar are also a great touch. Perhaps the best part? You can snag it for just under $100. Corduroy is a very casual fabric, consider ditching the loafers for some classic plimsolls. Shake things up a bit with bright-colored chinos or jeans in a light wash.